Welcome to the Wilson Middle School Robotics website! We are a team of middle school students exploring STEAM (Science, Technology, Engineering, Art, and Mathematics) related subjects. Through this club, our team learns the fundamentals of mechanical design, engineering, programming, and teamwork through a unified, creative mindset. Our group must implement these skills to excel in a competitive environment and organize ourselves to be successful and efficient in completion of several projects. This will prepare us to pursue careers in technical fields or at least gain useful social skills. We have participated in competitions such as Hydrobot, iARoc, Botball, and more. We are trying to raise funds to keep our club going and our goal is to raise at least $15,000 through fundraising, donations, and grants. SUPPORT OUR INDIEGOGO ONLINE FUNDRAISER HERE! Eat out and support our Mogl fundraiser here! We meet Mondays-Fridays except Thursdays from 3:36 - 5:00 PM and most Saturdays from 8:00-12:00 PM in Room 201. Check the calendar for exceptions. This is the video Mr. Michener made about Botball in the Hoover Cluster. Things have been super busy in our club so forgive us for the lack of blog posts. We have been hard at work on our different competitions. We finally competed in the four different events this past Saturday at the Del Mar Fairgrounds during the STEAM Maker Festival. We're proud to announce that all our hard work has paid off. We walked home with five new trophies! The Wilson Boys Team won 1st place while the Wilson Girls Team took home 2nd! Our team maxed out as far as the number of weights. The only thing we got docked down for was our documentation so we ended up with 2nd place. We're happy with that, but next time we'll have our documentation in order as well. Our team took the 3rd place trophy here. The myth they explored had to do with the Captain America film and an investigation of terminal velocity. Our team won a Judges Award Trophy for "Most Creative" outfit for our hot cheetos dress. The entire event was super fun! There were so many booths and exhibits with hands-on activities including candle rolling, train-building, race-car derby, human fooseball, and more! What's up next for our team? 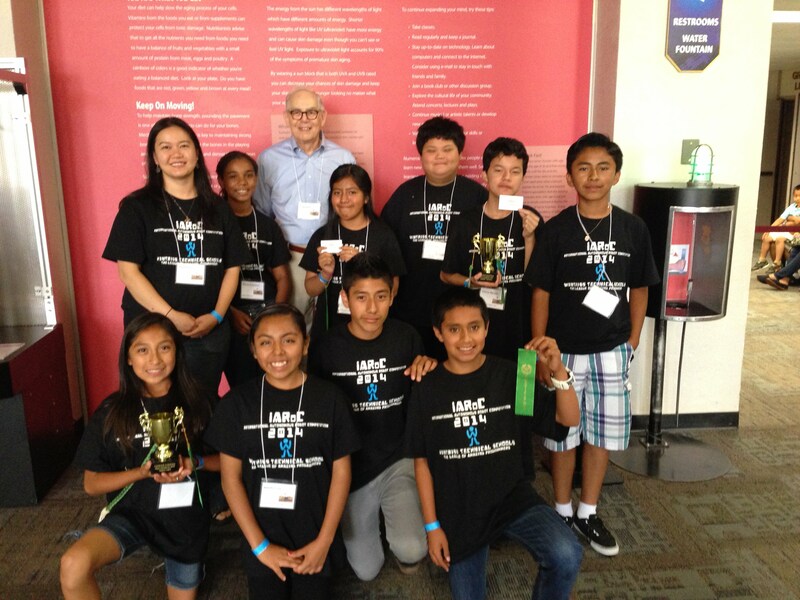 We will be continuing to improve our programming skills and preparing for our next competition! You Can Support Us Without Spending an Extra Penny! For those supporters who aren't able to financially support us regarding our Indiegogo fundraiser, there's another way you can help! We stumbled upon an online fundraiser that allows you to shop online as you would normally and have a percentage of your purchases contribute to our club account! It's called Ziggedy. We just signed up and if you sign up for an account in the next 30 days using the following link: www.ziggedy.com/wilsonkpease/signup, we get $1 for each account made. All that's required is a name and email address (you can also change your settings to be anonymous if you'd like). Their website says that they won't spam or sell your information. If you install their Ziggedy browser app, that's another $5 that goes into our account. If you never purchase anything online, you still have contributed $6 to our account! A percentage of anything you purchase by first clicking through Ziggedy will be credited to our account and sent to the school. Spread the word and our link! www.ziggedy.com/wilsonkpease/signup Any account created gets us $1 bonus and gets us closer to our goal! Ziggedy is completely free (i.e., there is absolutely no difference in the price you pay), and it takes only one extra click through Ziggedy before you shop. Share the link with your friends and family. Thank you for your support! We're excited to starting preparing! If you want to see us in action, mark your calendars and come visit us at the festival! Last week was a super busy and exciting time for members of our club. On Tuesday, four of the Robotics Club students were selected to go to the NBC 7 studios downtown to showcase a couple robots that they built on live TV to help promote the San Diego Science Alliance's High Tech Fair. Students setting up the tape for their robot. On Wednesday evening, 10 of the students went to the fair and took shifts speaking to the public and demonstrating their robots. They were also able to visit the various other booths and participate in the hands-on activities themselves. Go to my stories and see what our robotics students been working. What do we do during our meetings? Would you like to see? Boys in the beginning stages of building a bot. Helping with a robot that we will present on TV Tuesday, Oct 13th. Boys watching the tutorial on how to use the 3D Design software. Girls team writing their first program. Yes, but not the way they wanted it to. So now it's time to problem-solve. Hi my name is Juan! today we are learning how to build and program. Today we are using our imagination and this student is building a car. Those 2 black squares are motors for the wheels. and he`s gonna program it in a couple of days! Later on the year we will go on Field trips and defend our name as Wilson Middle school champions! So far we`re just being creative and it's not just work, it's fun! Don't worry the wires won't shock so come and if you want to join and your in the school go to the computer lab and see Mrs.pease! Last week marked the official start of the Wilson Middle School Robotics Club! Without much advertising, we already have close to 40 members and we're still growing! The students were introduced to some basic coding using the Hour of Code site and some students starting building and programming robots. Everyone is super excited about our new season! We can't wait for competition time! Students are learning how to build robots. There are different activities that students can play at robotics club! Here are students learning the hour of code in our website that will teach them basic coding. Some former robotics students came to mentor the new students. Today we are hustling to finish the final touches to complete the program so it could function well on Saturday on the official Botball competition so we could see all of our hard work pay off and see all other San Diego County Botball teams compete. Which is located in the Del Mar Fair. After all the work and fun day we are going to have even more fun at the Del Mar Fair games and rides.